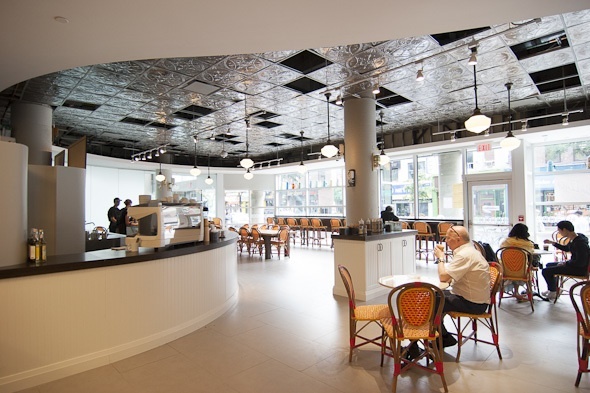 Balzac's Coffee at the Toronto Reference Library has finally opened, allowing knowledge-seeking scholars to satiate their coffee cravings. Or just people in the area looking for good espresso. Whatever. This arrival has been a coveted one as the library underwent renovations, and Balzac's, in the meantime, went ahead an scooped itself with a new location at Ryerson University . Though, I should be clear â the main floor of the library did once host its own little coffee shop, but that was more akin to the type of thing you'd find at Wilson Station. Not now. 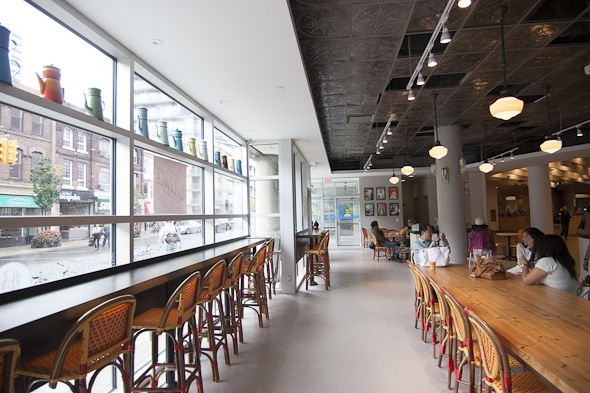 Balzac's has taken over the west-facing streetside space, decking it out with its signature vintage-esque posters, cool tin ceiling and large communal table. The one omission in terms of decor is the custom Art Deco tile floor you'll find at Balzac's Ryerson and Liberty Village locations. Here, it's just a characterless grey ground. But the library had already put it in, I'm told, so Balzac's just decided to go with it. Founder and co-owner Diana Olsen has remarked that this newest location is perfect fit for Balzac's, especially since she has spent countless hours in the library studying up for her business. And now, I suppose, it's onto the next round of entrepreneurs. 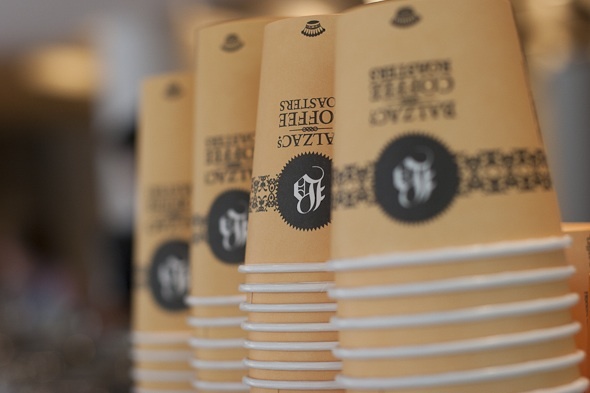 Their fuel, now, is Balzac's signature fair trade organic espresso blend roasted in Stoney Creek, and plenty of treats from bakers such as Circles and Squares (with sandwiches to come). Essentially, the concept hasn't changed; it's just a new location. In characteristic Balzac's fashion, the tables at this cafe are generously spaced (that's an understatement) with a communal table for 12 or more. But the most coveted seats, arguably, are those lining the window bar; those that look out over Yonge just waiting to devour its sidewalk entertainment. 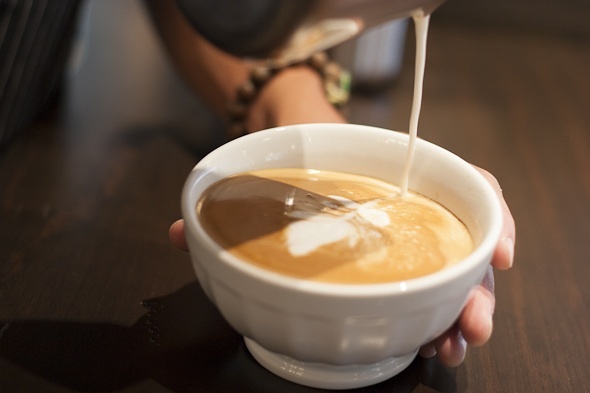 Picture a snowy afternoon, an overdue essay, and one of Balsac's creamy, foam-art-adorned lattes. This cafe already seems to offer that vibe, though thankfully for now, without the snow. 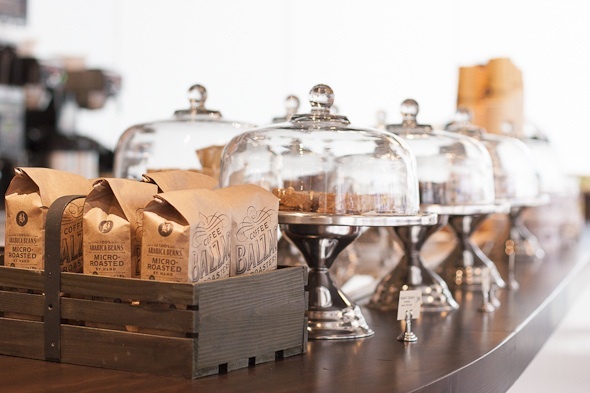 Balzac's is accessible both from the street and inside the library, and visitors are permitted to take their cappucinos ($3.25/$4.00), Americanos ($2.25/$2.75), muffins, squares and more out onto the library's main floor (but keep the books in the library!). When I visit I can't tell if I recognize any of the baristas from Balzac's other locations, but I do note the concentration and precision they execute when handling that Nuova Simonelli. And the beans, as usual, are available to take home. 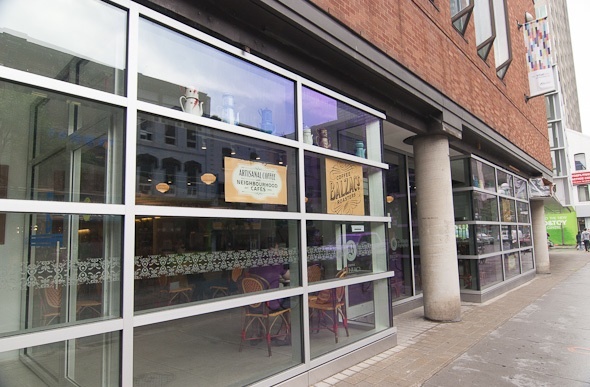 Balzac's will be open pretty much whenever the library's doors are open (and then some), with the cafe operating from 7 a.m. to 9 p.m. during the week, 8 a.m. to 6 p.m. on Saturday, and 9 a.m. to 5 p.m. on Sunday. Photos by Gloria Nieto .